There are weeks where it seems like every piece of physics news mentions quantum computing—but we are nowhere near a quantum iPhone. You probably remember that computers can consist of billions of nanometer-scale transistors etched into silicon. Those chips used to be enormous, room-sized setups where instead of transistors, there were tubes the size of light bulbs. Physicists in the quantum computing world are still trying to pick out the best vacuum tubes. Headlines emerged today mentioning a new kind of “qubit” that could make quantum computers more easily. But it would help to first understand where quantum computing is overall. Here’s a quick quantum computing recap. Regular computer bits store information with a binary yes-no system, like a wire with or without a current. A quantum bit, or qubit, instead relies on the probabilistic nature of quantum mechanics: instead of yes and no, there’s a pair of options with an associated probability for each. There are algorithms in science and artificial intelligence that could run more quickly or efficiently with such a computing system. There are some mechanical systems that store qubits, but they’ve proven expensive, bulky, or difficult to keep in that fragile quantum state without collapsing into a classical bit with a probability of 100 percent yes or no. “This design provides a realizable blueprint for scalable spin-based quantum computers in silicon,” the authors write in the paper, published today in the journal Nature Communications. The paper builds on Bruce Kane’s well-known 1998 quantum computer proposal in Nature, where qubits are stored as properties of atoms, and performing computer operations is done by applying an electric field. The team proposes what they call “flip-flop qubits,” where a phosphorous atom sits in a silicon semiconductor. The electron and the nucleus both contain intrinsic properties called “spin” that can assume values called “up” and “down” (spin is a property built into particles like magnetism is built into fridge magnets). 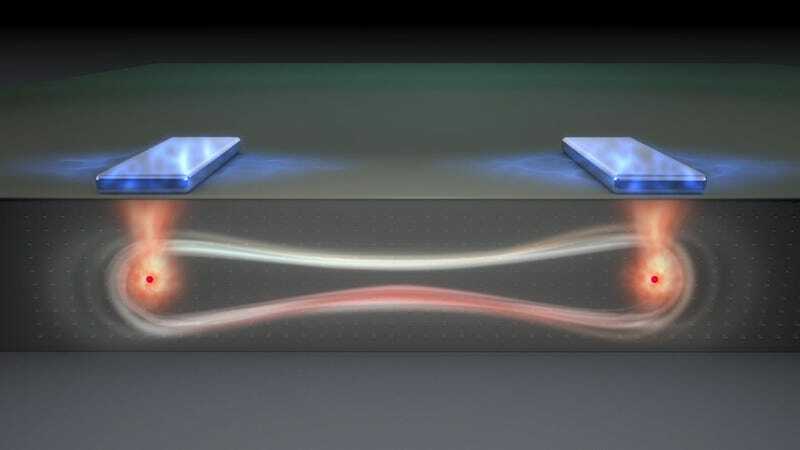 The flip-flop qubit’s ones and zeroes become stored when an electric field causes the electron and nucleus’ spins to snap into opposite states, one up and the other down, or vice versa. These qubits would have a few benefits, say the researchers: They’d have very low error rates, for example. Qubits are fragile things, so any real-world quantum computer must still work regardless of whether some of its qubits fall apart, and errors should be as infrequent as possible. These qubits are also built into silicon and controlled by electric fields, meaning they could potentially be integrated into silicon chips. The qubits can interact with one another over large distances, which leaves room for other non-quantum pieces of the quantum computer. But the authors point out that some challenges do exist, including the handling of noise and phonons (tiny vibrations). This is just one of several ideas researchers have for qubits. Companies are already plowing ahead building quantum computers—you may have heard of the controversial D-Wave computer with two thousand qubits (this is far less powerful than scientists would want, and there’s debate over whether it can outperform any classical computers). The D-Wave relies on superconductors to create its qubits, materials with no electronic resistance that show quantum mechanical effects on macroscopic scales. There are also existing ion traps, where atoms on some surface are trapped by electric fields, and optics solutions where qubit information gets stored on light particles or photons. It’s important to stay realistic with all of this though. Martin LaForest, senior manager of scientific outreach also at the Institute for Quantum Computing at the University of Waterloo recently told me that we’re now at the junction where physical quantum computer blueprints are beginning to meet theoretical demand required to reap quantum computing’s benefits. But we’re still a ways off from a computer that scientists actually use. Chris Wilson (again from the IQC) recently told me that a quantum computer that works the way you think when you hear “computer” would require possibly a hundred thousand physical qubits. “You’re talking about a machine that looks like a modern supercomputer, something that fills a warehouse,” he said. Ultimately, this latest advance is a blueprint for what could potentially be some important quantum computer hardware. Even still, don’t expect to see a quantum computer in your office any time soon (you know, unless you work at IBM or Google).